Today at work today we are having an ugly Christmas sweater party! Thanks to my wonderful neighbor, I am decked out! I even made a headband to match. We’ll be voting today and the person with the ugliest outfit wins $100! I think my co-worker has me beat for best/ugliest outfit. If I didn’t love her so much I’d be so mad at her! And in case you were wondering I am, in fact, also wearing red shoes! Oh this is glorious! I wish my work had fun days like this! You are rocking the ugly sweater for sure!! Also, your co-workers outfit is awful, but awesome!! haha that's hilarious!! Think your coworker might have you beat, but your sweater is awesomee!! Oh how I love tacky Christmas sweaters! We have a party in honor of them every year! With money at stake I bet those tacky sweaters will get out of hand! 😉 haha I love yours!!! I think this post is appropriate for your "Awkward & Awesome" column. I want your co-workers ornament earrings. Hilarious! Haha this is so neat! 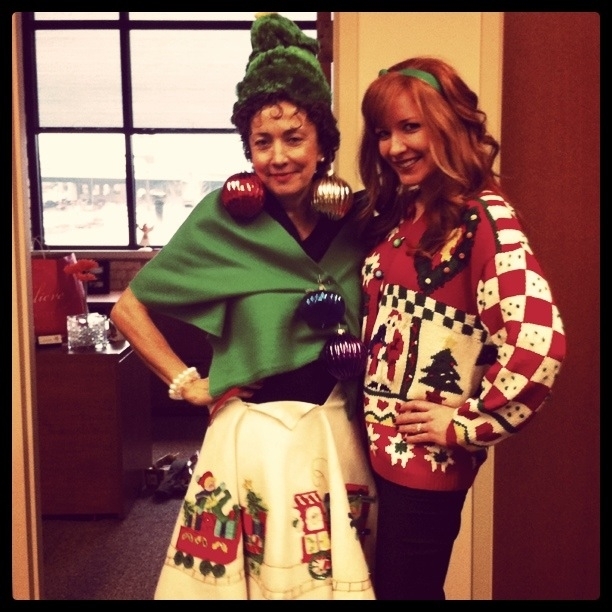 You two look awesome in your ugly sweaters. So much fun! Julie, you are to beautiful to look bad in anything. Your co-worker is hilarious. Tomorrow we have an ugly sweater contest at work. Hope you win. 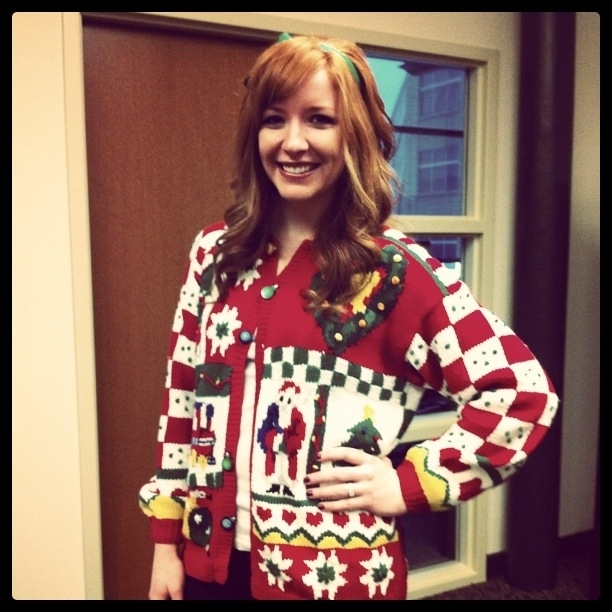 I love ugly sweater parties;))there so much fun..
Im a new follower, check out my blog as well. Love it! And I don't even question the red shoes. I'm wearing my red shoes today too! Send me your headband. Please and thank you? love your sweater hahah! I'm going to a tacky Christmas party tomorrow! Fun! We just had an Ugly Christmas Sweater Party this week, too, and it was awesome. I was the big winner with a homemade lace-covered snowman vest and other crazy pieces, haha! Definitely spiced up the work day. I don't even have enough words for HOW CRAZY AWESOME this is!